This is a rich dip that I like best with crispy, watery crudités like celery sticks, red-pepper slices, snow peas, and endive. It comes together quickly, so have ingredients ready and close at hand. 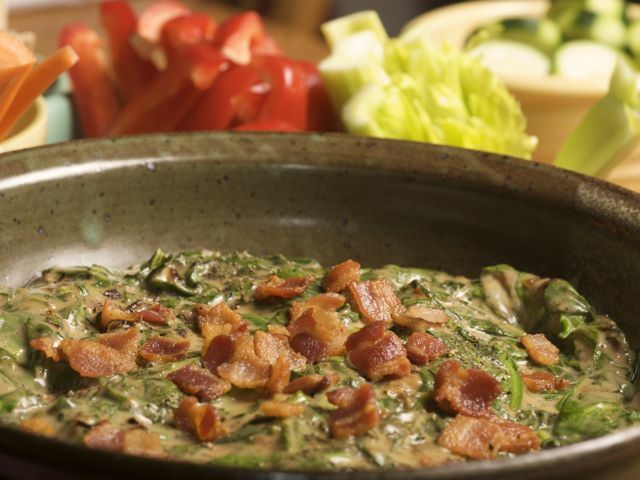 You can make the dip 1 to 2 days in advance, without the bacon, and re-warm it in a 350-degree oven for 7 to 8 minutes. Stir in and sprinkle on the bacon just before serving. Whisk the buttermilk into the cornstarch in a small bowl and set aside. Heat the olive oil in a sauté pan over medium-low heat and cook the bacon, stirring occasionally, until crisp and well-browned. Remove the bacon with a slotted spoon, drain well on paper towels, and set aside. Pour off all the fat and, still over medium-low heat, sauté the onion in the fat that clings to the pan until translucent. Add the red-wine vinegar and buttermilk mixture and simmer for 1 minute. Reduce the heat to low and add the blue cheese, whisking until melted and smooth. Stir in the spinach until wilted. Remove the pan from the heat and stir in half of the reserved bacon and season to taste with pepper. Pour into a 9-inch shallow gratin dish or glass pie plate and sprinkle the remaining bacon over the top.